I was recently selected to review Barbie Megabloks... but Jake is a boy and Poppy is a baby? Yes, this is true, but I decided to accept the review for two reasons. 1. Jake loves anything that is 'small world' play; so houses, shops, people, etc and loves construction toys... 2. and. Jake's two best friends are lovely girls that we see at least once a week for play dates and I thought they would love these! And they did. And, boy so did Jake! He was excited when it arrived, just as he is when anything arrives in the post for him, we opened it up and set it all out on the table. 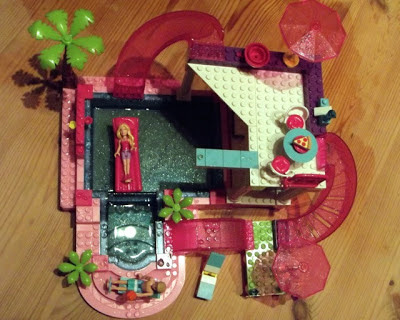 We got a Build 'n Style Pool Party, Build 'n Style Fashion Stand and the Barbie Puppy Pals. Jake really enjoyed building the pool with me, I have to admit that I really enjoyed it too! I was really impressed with the details and opportunities to build, style and play. The pool house included an Ipod and speakers, flowers, pizza, hot dogs, table and chairs, bowls and plates, glasses and juice carton, sun loungers, a diving board, parasols and a lilo. The fashion stand includes a hairdryer and brush which Jake pretended to use on Poppy (cute). Jake played with it for a long time and his favourite thing of all was that we could actually fill the pool up with real water. 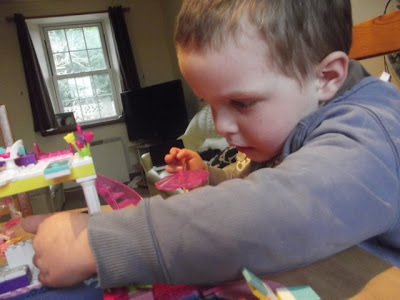 Then the following day his friend came to play; they have recently started to play together more purposefully so this was a great way to encourage that. Sara enjoyed playing with the Barbie Megabloks too, she especially liked being able to add the stickers to the pieces. Sara and Jake interacted while playing and discussed what should go where and who could have which pieces. A few days later Ella came to play and she also really enjoyed building and playing with the sets. 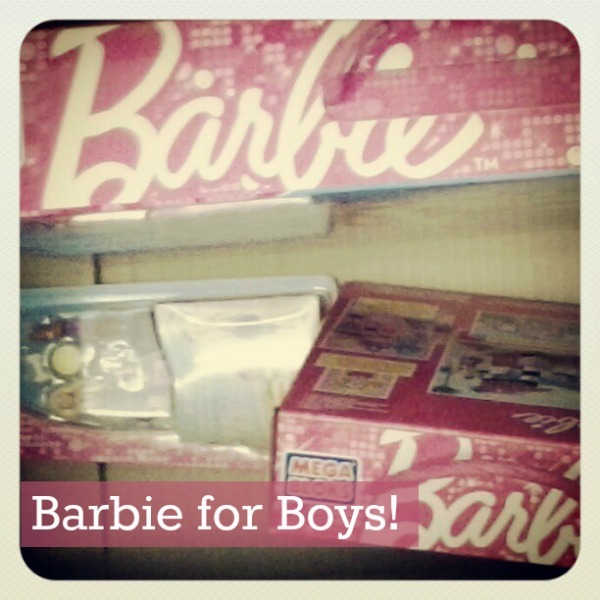 We really enjoyed playing with the Barbie Megabloks and it was really interesting to see that the gender stereotypes just don't apply. 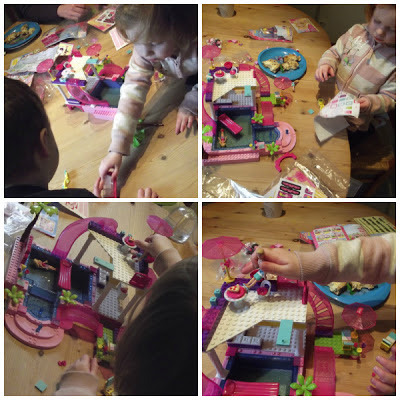 Jake loves building and small things, he doesn't care at all that it was pink and sparkly, and the play sets have enough scope to allow 2 or more children to play together so could be great for encouraging a brother and sister to play together. This product is recommended for children over 4 years old due to the very small parts. 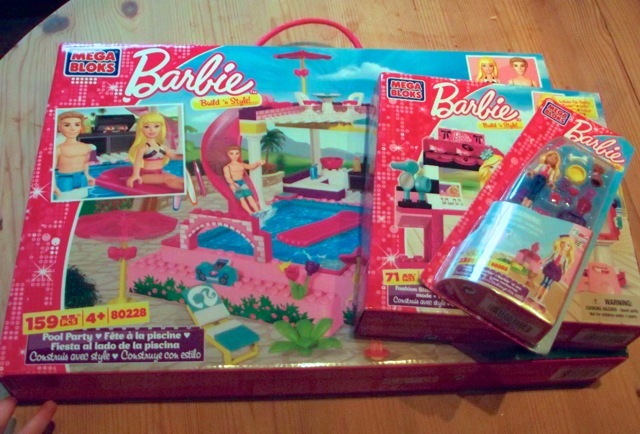 You can find out more about the Barbie Megabloks here. I was given the toys featured here and will be financially compensated for this post, by Handpicked Media.